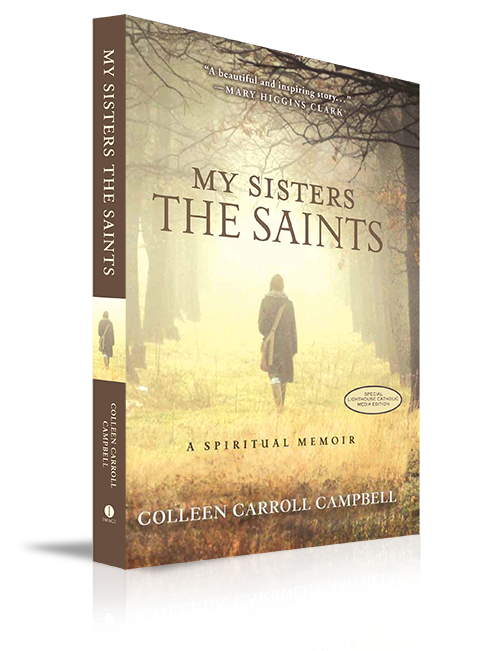 I can't tell you how much I enjoyed My Sisters the Saints by Colleen Carroll Campbell! 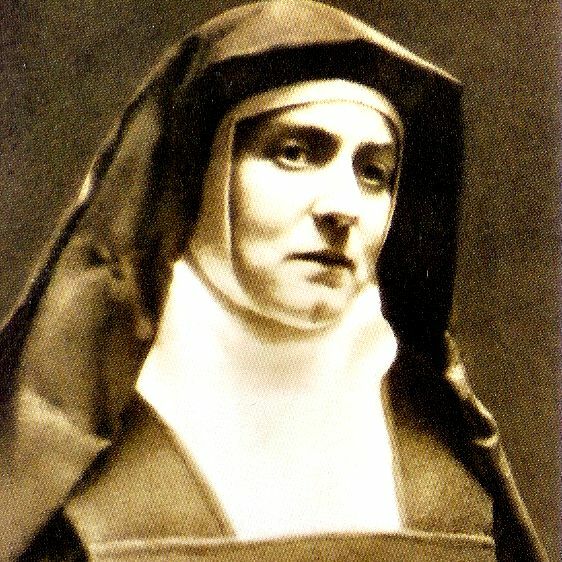 This book which is described as a spiritual memoir, includes Colleen's own faith journey along with the impact of St. Teresa of Avila, St. Faustina, St. Therese of Lisieux, St. Teresa Benedicta of the Cross (Edith Stein), Blessed Mother Teresa and Mary the Mother of Jesus. I had met Colleen a couple years ago when she gave a speech in Ft. Myers at the Diocese of Venice Women's Conference. I had admired her resume and the things she had accomplished from a worldly perspective. 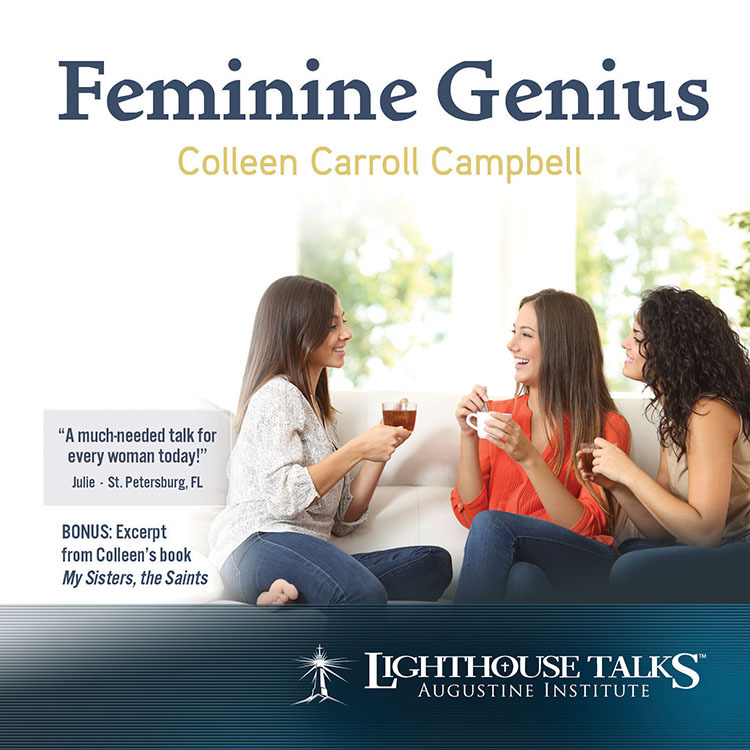 I worked with her to bring her talk Feminine Genius into the Lighthouse Catholic Media line up. But little did I know what she is truly made of. Although this book includes several intercessors from heaven, Colleen has her feet firmly planted on earth, with dilemmas and challenges many of us face. Her ability to share how we can grow in holiness and "take up our own crosses" when we place our faith life first and ask for heavenly guidance is amazing. I recommend this book to all women, college age on up. Anyone who has struggled to find the meaning of life, to carry a burden that seemed all too heavy, to make sense of what it means to be a women in today's culture, will gain so much from reading it. And, a bonus for me is Colleen turned me on to at least two other books that I want to read soon: St Teresa of Avila by Marcell Auclair and The Collected works of St John of the Cross. Her dad read these over and over and introduced them to her-what a legacy! If you've read My Sisters the Saints, please share your comments! "When night comes, and retrospect shows that everything was patchwork and much that one had planned left undone, when so many things rouse shame and regret, then take all as is, lay it in God's hands, and offer it up to Him. In this way we will be able to rest in Him, actually to rest and to begin the new day like a new life." A woman who follows these natural rhythms of prayer, work, and rest will be rewarded with abiding peace, Edith says. She will find in Jesus a worthy outlet for her feminine longing to lose herself in love." 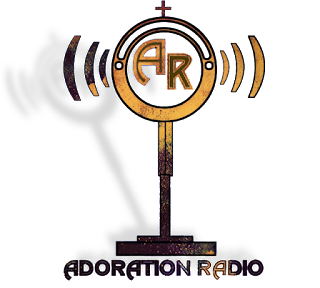 Excited to let you know that my friend Mary Graham at Culture of Life Media, has started a new internet radio station, Adoration Radio. 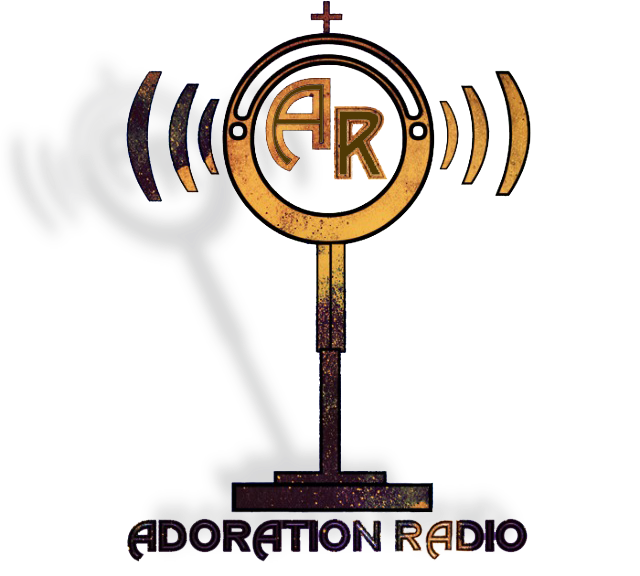 Adoration Radio plays contemporary music dedicated to the glory of God~ 24 hours a day. Tune in while you are at your desk or access through your phone! This article was recently published in Voices Magazine. During Lent there are several saints’ days on the liturgical calendar that we ordinarily celebrate. Note that this year, March 25 is within Holy Week, so the Church’s celebration of the Solemnity of the Annunciation has been transferred to Monday, April 8, following the Second Sunday of Easter. Also, St. Patrick’s Day, March 17, falls on a Sunday during Lent this year, so this “optional memorial” (in the US) is not on the official calendar, though it may be observed on Saturday, March 16. Irish or not, all of us need to celebrate Saint Patrick’s Day! The Patron Saint of Ireland faced huge obstacles in his life. But through the grace of God, he converted a country. Read up on the story of Saint Patrick (wf-f.org/St. Patrick'sday.html) and inspire your teenagers with it. He was captured as a teenage slave and forced to go to Ireland. Once freed, he willingly returned to teach the Irish the Catholic faith. How do we use the sufferings we have had; do we gain strength from them, and use them for good? With spring on its way, it is fun to get some shamrocks or clovers and plant them inside the home. 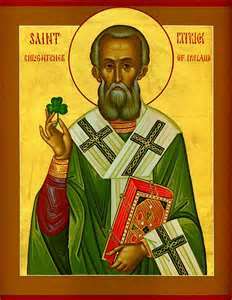 Use the three-leaf clover to talk about the Trinity, Three Persons in One God, as Saint Patrick did. 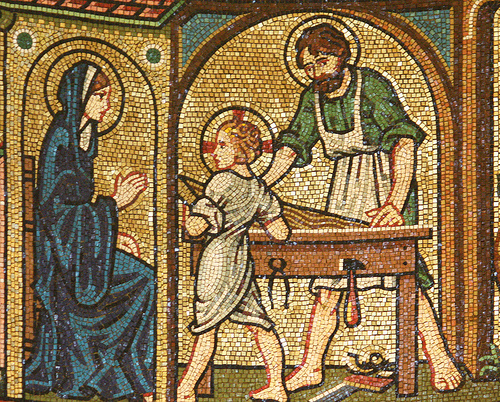 Saint Joseph. husband of the Blessed Virgin Mary, has a lot of heavenly duties. He is the Patron of the Universal Church. He is the patron of fathers and homes. Many ask his intercession to find a mate or sell a house. That’s a tall order for a man who has not one spoken word recorded in the Bible! But his silence speaks loudly. He was all about doing the will of God and listening to what God asked of him. Let’s follow his example by speaking less, listening more and trying our best to do God’s will. How quiet can I be today? 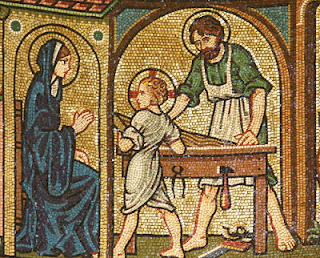 For the readings of the Mass of Saint Joseph, special prayers for his intercession, and suggestions for family celebration, go to wf-f.org/stjoseph.html. Holy Week begins on Passion (Palm) Sunday, March 24, this year. The Mass for Passion Sunday begins with the gospel reading of Jesus’ triumphant entry into Jerusalem. Palms are distributed to all in attendance. The palms are blessed with holy water. During the Mass the Passion of Christ is read in its entirety. The Chrism Mass is traditionally held on Holy Thursday, but in some dioceses is it moved to Tuesday of Holy Week. This great liturgy blesses the holy oils to be used for the next year. The oils blessed at the Chrism Mass go back to each parish and are presented to the pastor at the Mass of the Lord’s Supper, Thursday night. The oils blessed include those used for the anointing during baptism, confirmation, and the oils for the anointing of the sick. The Mass of the Lord’s Supper, on the evening of Holy Thursday, is perhaps one of my most favorite celebrations of the Church year. It commemorates both the institution of the Holy Eucharist and the holy priesthood. During the Mass, the priest may reenact Jesus’ washing of His disciples feet. At the end of the liturgy, the Blessed Sacrament is moved to a chapel of repose. Following the Mass and into the night, people can come and pray before the Blessed Sacrament, as the Lord prayed all night in the garden of Gethsemane. 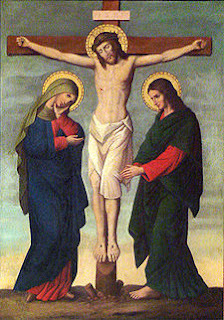 Holy Thursday is a very fitting day to pray the Luminous Mysteries of the Holy Rosary as the fifth Luminous Mystery meditates on the institution of the Eucharist and the priesthood. Some families like to observe a Christian version of the Passover Seder, to commemorate the Last Supper of Jesus and His disciples. Details about this ceremonial family meal and its preparation are accessible on the WFF website: wf-f.org/Seder.html. Good Friday is the only day of the year when Mass is not celebrated. At the Good Friday service, traditionally celebrated at 3 p.m. (the hour Jesus Christ died on the cross), pre-sanctified hosts from Holy Thursday are distributed to participants. There is no instrumental accompaniment to singing at the service. During the Good Friday service, the cross is venerated by the faithful with either a touch or a kiss. The intercessory prayers are full of richness for all the people of the world. More on the observance of Good Friday: wf-f.org/GoodFriday.html. In our family we turn off all televisions and electronics on Good Friday. All abstain from meat and those over 14 are called upon to fast. The kids don’t have school and we are usually home together. If we are unable to attend the Good Friday service at church, we pray the Stations of the Cross together. Weather permitting, it is beautiful to do them outside. One year we moved around 14 trees in our yard as we meditated on the Way of the Cross with our visiting cousins. More on the Stations of the Cross: wf-f.org/Stations-Cross.html. Holy Saturday, March 30, is another day of quiet preparation for the great feast of Easter. At home, it is a time to prepare the food for Easter and some people hold an Easter-egg hunt this day. Saturday evening is the Easter Vigil Mass. The Easter Vigil may begin with a ceremonial lighting of a fire outside of the church (or sometimes within the church) and from this fire a large candle symbolizing the Light of Christ (Lumen Christi) is lit. From the Christ candle, the people’s candles are ceremonially lit. The seven readings at the Vigil Mass recall the history of Salvation. The sacraments of baptism, confirmation, and Holy Communion are received for the first time by the candidates and catechumens during the Easter Vigil. Julie Musselman is a wife and mother of six children who lives in St. Petersburg, Florida. She is a region manager for Lighthouse Catholic Media and loves all things Catholic, especially the Eucharist, the saints, and the Rosary. When Julie’s not driving carpool, doing laundry, or avoiding cooking, she blogs at juliemusselman.com and lighthouse-catholic.com. Our good friend Fr. Ken Malley had the opportunity last August to visit Turkey. In this YouTube extravaganza, Fr. Malley takes us on a virtual tour to the Seven Churches of the book of Revelation!